When it comes to companies and brands that we know and love, there are some that can be depended on for one standard product time and time again... while others seem to continually impress us with their innovative and new ideas. A prime example? Mega Bloks. Best known for their large, colorful, easy to manipulate building blocks, they also have taken things to a new level time and time again by introducing new ways to play with them. Their sets have expanded to include trucks, farms, trains, recognizable characters, games (we love Domino Build! ), and much more to encourage imaginative play. 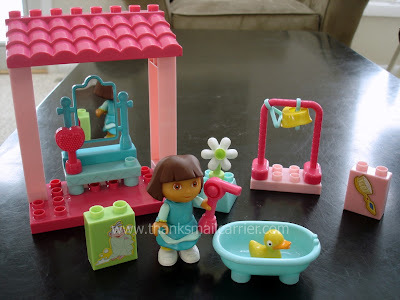 So, when the new Mega Bloks Dora's Bath Time buildable playset arrived, I knew both of my girls would have a great time going on endless adventures with Dora and her bathtub. Arriving with everything we needed to build Dora's cute bathroom, Big Sister E and Little Sister B were smiling already as we unpacked Dora and each of her cute accessories. 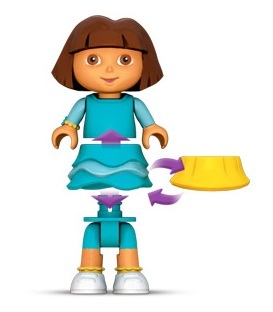 As we began to admire the bathtub, clothes hangers, rubber ducky, hair dryer, and more, we also noticed the extra skirt for Dora and realized that she is a Build & Dress character. Right away we had to try out her different outfits as we put together her bathroom! 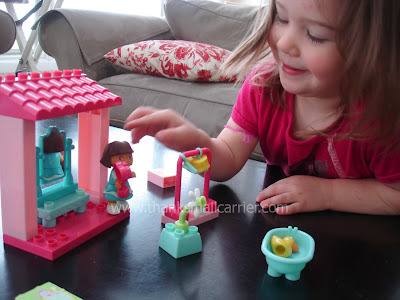 As we put together all of the Mega Bloks pieces on the included platform, it was fun to see the bathroom come together and just how many different ways that we could configure the vanity, daisy, brush, and more. Due to the way that everything can be constructed exactly as each child imagines, we have been able to play with this in so many different ways and never get tired of it. One day Dora will have a bath and dry her hair, the next day she is changing clothes to get ready to go meet her friends, and the following day she is brushing the duck to "make him pretty." The options and scenarios are endless! 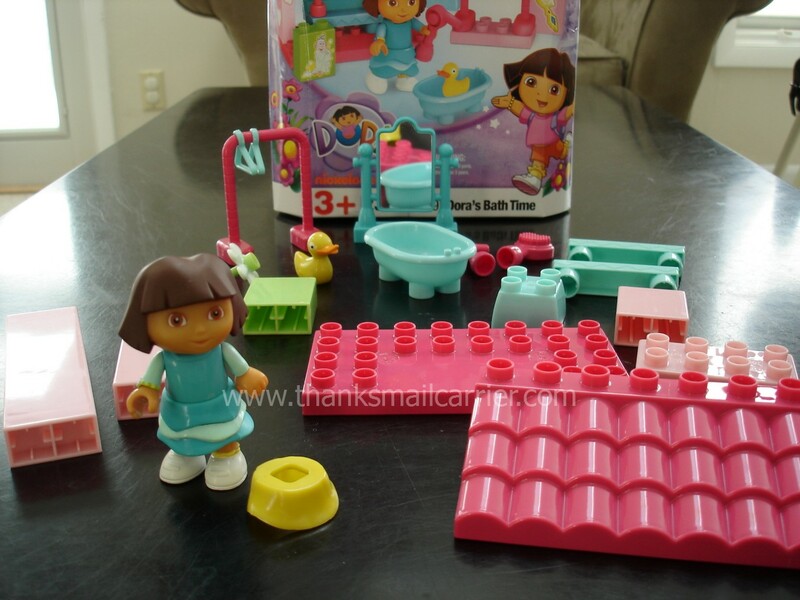 With all of the customizable possibilities and the way that this playset can be combined with other Mega Bloks for more fun, Dora's Bath Time is a great gift for any young Dora fans. Little hands won't have any trouble with the pieces (it is recommended for ages 3+ due to the small size of many of the accessories) and the quality is nothing less than what we expect from MEGA Brands. Retailing for around $14.99, Mega Bloks Dora's Bath Time can be purchased at a variety of retailers such as Kmart, Target, and Walmart, as well as online at Amazon. MEGA Brands can be found on Twitter and Facebook and, for big fans, the Mega Bloks Family Club is the place to find offers, contests, promotions, a free email newsletter, an educational and informative blog, and even a printable coupon for $5 off any $30 or more Mega Bloks purchase. Oh, that looks fun! I hope it is still around when my son isn't in the phase of eating everything!